Note: this is not a cleaning product, it is a sanitiser. (for manual or automatic bath dosing systems) DO NOT BATH IN THIS SOLUTION this is for disinfection after your bath. 1. After using the whirlpool bath, drain off the bath water or fill up to a height where the nozzles are just covered with water. Adjust nozzles downwards. Observe the cleaning and disinfection notes of the whirlpool manufacturer! 2. Pour approx. 240 ml of the agent in the tub (the recommended concentration is max. 150 ml of the agent to 100 l of water). 3. Close the air controller and start the massage system for approx. 5 minutes. 4. After switching off the system leave the disinfectant solution in the tub for 30 minutes. 5. Afterwards switch on the massage system for further 5 minutes. 6. Empty the tub, refill it with cold water and rinse it. Rinse the massage system as well. Dosing: max. 150 ml in 100 l of water, let react. Warning: Never take a bath in the disinfectant solution! Close the bottle containing the disinfectant carefully after use. Keep in tightly closed original containers in cold, dry and well-ventilated areas. Protect against freezing. Do not store with foodstuffs, drinks and animal feed. Can you tell me if this product is suitable for a victory spa bath which automatically runs a disinfecting cycle when the bath is full, before someone has used the bath? 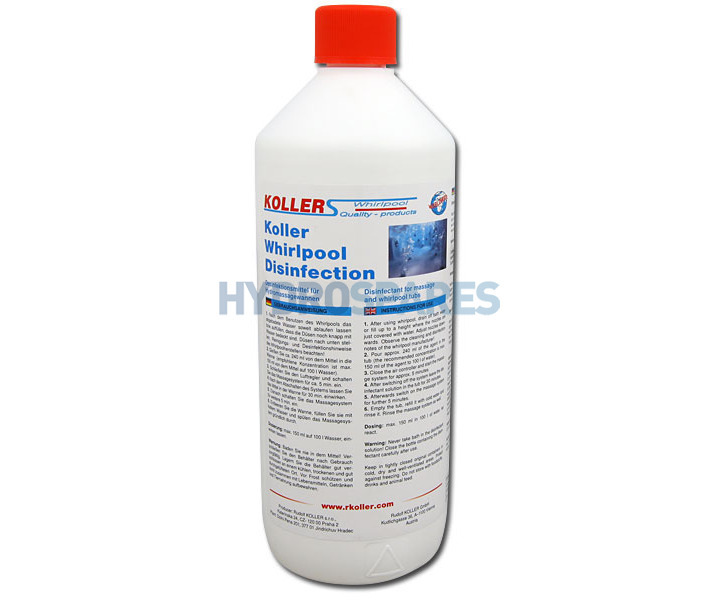 This product can be used in whirlpool baths with an automatic disinfection chamber but its better to be used after you have had a bath & not immediately before because you should not risk bathing in the solution. However if your system has a way of flushing the pipes through after the sanitising process then it will be fine as ideally it should be rinsed through before bathing. If you want a sanitiser that does not need rinsing then you could just use the sanitising tablets & pop one directly into the bath water after you get out the bath (these don\'t need rinsing) they leave a low level chlorine residual in the pipes that minimise baterial growth in between cleans.